The study is devoted to manufacturing and characterising a new paper material with antimicrobial properties, as an alternative to paper containing silver nanoparticles (NPs) which are claimed to be harmful to the ecosphere. In place of silver NPs, the new material contains faujasite mineral (from the faujasite group) exchanged with silver cations which are firmly attached to the material’s lattice. The material was obtained by typical ion exchange and additional elution with EDTA salt to dispose of the remaining silver oxide NPs. Thus, modified faujasite was then added to paper pulp. The new, modified paper showed better quality in terms of acidity, tensile strength and cellulose degree of polymerisation compared to paper containing Ag NPs. The visual quality of the paper is also better than that containing Ag NPs. The new material shows high potential for use in food and pharmaceutics packaging. Zeolites and zeolite-based materials are biocompatible minerals that are commonly used in a variety of antibacterial and antifungal applications, such as medicine (Matsuura et al. 1997; Danilczuk et al. 2008), food packaging (Zagory 1995; Suslow and Crops 1997; Appendini and Hotchkiss 2002) and the clothing industry (Takai et al. 2002; Grancaric et al. 2012). According to the literature, there is still a need for intensive research into new materials that could offer additional features in comparison to those currently available (Zampino et al. 2011; Fang et al. 2014; Vukoje et al. 2014), and which may be used as active packaging for the safe storage of a great many types of goods. The antimicrobial properties of modified natural polymers are of great interest (Kukharenko et al. 2014; Littunen et al. 2016), but the mobility and potential migration of silver in such materials can be problematic. The antimicrobial properties of different porous materials are also still being tested (Wang et al. 2006; Yang et al. 2009; Azócar et al. 2012; Nassar and Youssef 2012; Youssef et al. 2013), and zeolites seem to be the best alternative because of their mechanical resistivity, sorptive and catalytic properties which can eliminate or decrease the problem of environmental risks. Packaging is defined as “active” if it can provide mechanical, chemical and antimicrobial protection for the items stored inside (Gutiérrez et al. 2009). Thus, active packaging should not only protect the stored objects, but also extend their shelf-life. Such functionalities can be secured by using packaging capable of the absorption of odours arising from the degradation of organic items, especially of compounds containing sulphur or other volatile organic compounds (Vermeiren et al. 1999). Another valuable property of packaging materials is their antimicrobial activity against bacteria, fungi and viruses (Vermeiren et al. 1999). Silver has, since ancient times, been known as a biocide, a property that is today exploited by the addition of silver nanoparticles (NPs) to many everyday goods. The antimicrobial activity of silver has been confirmed on a wide range of organisms, including bacteria, viruses and fungi (Russel and Hugo 1994; Damm et al. 2005). Simultaneously, concerns about the environmental impact of silver ions and particles have been growing in recent years, as expressed in literature (Böswald et al. 1999; Venous 1999; Kim et al. 2009; Marambio-Jones and Hoek 2010; Echegoyen and Nerín 2013; Cushen et al. 2014). The content of silver in everyday goods, and thus also in packaging, is not currently regulated either in the European Union or in the United States of America (Seaton et al. 2010; Langauer-Lewowicka and Pawlas 2015; Mackevica et al. 2016). Since the influence of silver particles on the environment and ecosystem is still a subject of intense scientific debate (Moore 2006; Bystrzejewska-Piotrowska et al. 2009; Giri 2014), and as it has already been established that they also have a detrimental effect on the cells of animals including human and eukaryotic organisms (AshaRani et al. 2009; Panyala et al. 2008), it seems important to look for alternative materials that exhibit equally good antimicrobial properties but are safe to human beings. A solution to achieve this goal could be to trap silver ions or NPs in some kind of a solid matrix, which is one of the most important requirements of active packaging material because the contact of microbes and active agents should be selective and fully controlled, as described by Restuccia et al. (2010). Impregnation of silver cations onto the surface of the solid support could be a way to prevent silver migration. Another idea would be to use a solid of high surface area to enable contact with microbes. For this purpose, zeolite minerals seem a prospective media for silver anchoring, then used as an additive to other material such as paper (Baldevraj and Jagadish 2011). The use of zeolite as a filler in polymeric materials has been reported in literature (Bastani et al. 2013). 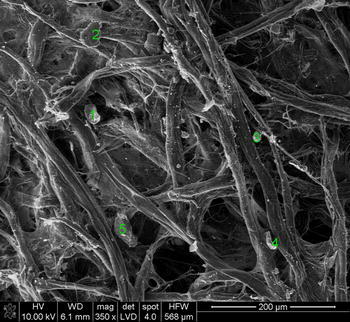 Some authors suggest that zeolites can enhance the antibacterial activity of thus prepared composite materials (Matsumura et al. 2003; Odabaş et al. 2011). The addition of zeolites to paper has a positive influence on its properties, such as change in acidity, permeability and resistance to hazardous compounds such as sulphur dioxide, nitrogen oxides and VOCs (Bishop et al. 2008; O’Connell et al. 2008). The goal of this research is to develop innovative, environmentally friendly packaging material based on paper with high biocidal activity, mechanical resistance and stable chemical compositions, and with the minimum silver content introduced into the zeolite structure. The material should also prevent the silver from migrating into the ecosphere. Y-type zeolite (Faujasite, FAU) in powder form was purchased from Zeolyst International (CBV-100). After conditioning at 23.5 °C and RH = 50% for 12 h, the zeolite in sodium form was used further for ion exchange from silver nitrate solutions. Silver nitrate was obtained from Avantor Performance Materials. Disodium ethylenediaminetetraacetate dihydrate (Na2EDTA·2H2O) from Sigma-Aldrich was used for another treatment to remove the external silver oxide NPs (those which were not exchanged with sodium cations). Faujasite exchanged with silver (AgFAU) was used as an additive to paper pulp. AgFAU samples were prepared by suspending 1.00 g of zeolite in 100 cm3 of 0.1 M AgNO3 solution in deionised water. Due to the light sensitivity of silver, suspensions were stirred in the darkness (300 rpm, 1 h). After ion exchange, AgFAU samples were filtered and washed with deionised water. After preparation, the obtained samples were dried in an oven at 60 °C for 8 h.
In order to remove the unexchanged (non-bonded) silver from the external surfaces of the zeolite, the prepared samples were washed with 10 cm3 of 0.01 M Na2EDTA solution and 10 cm3 of deionised water (the procedure was repeated five times in total) for reference. The washing procedure was repeated until the concentration of silver cations in the eluent reached a minimum constant value. After each step, the zeolite suspension was centrifuged (4000 rpm). The ion exchange capacity and EDTA washing efficiency were monitored by energy dispersive x-ray fluorescence spectroscopy (ED-XRF, ARL QUANT’X; Thermo Scientific, USA). Based on calibration, the Ag content in the zeolites was determined. The silver that remained on the zeolite surface was analysed by x-ray photoelectron spectroscopy (XPS) using the ESCA Prevac spectrometer equipped with a hemispheric analyser of charged XPS and AES particles (VG Scienta R3000). The x-ray tube was equipped with two anticathodes Mg/Al (power Mg/Al = 400/600 W), and the x-ray monochromator with the radiation source (single anticathode–Al). XPS spectra were calibrated to the carbon component C1 s binding (with energy of 285.0 eV). High resolution spectra were fitted using CasaXPS software. Two types of analysis were performed, according to the AgNP characterisation. At first we monitored the de novo formation of Ag NPs by UV–Vis spectroscopy. We observed the characteristic band assigned for AgNPs, hence we were sure of the NPs’ presence in suspension. This observation was confirmed by DLS experiments. In order to obtain paper sheets containing AgFAU, cellulose from Whatman filter paper was used. Prior to preparation, the Whatman paper sheets were conditioned according to the ASTM D685 norm, and under these conditions they were cut into 4 × 4 cm pieces following disintegration in 400 cm3 of deionised water using a dispersing instrument (IKA T18 Ultra-Turrax with stainless steel dispersing elements). Cellulose suspension (paper pulp) content is shown in Table 1. Elemental analysis of the obtained paper was performed with an XRF spectrometer (Thermo Scientific ED-XRF, thick Cu filter, Kα = 22.36 eV). Prior to XRF analysis, the obtained samples were digested in boiling 65% nitric acid for 15 min. The paper sheets containing AgFAU, along with the reference materials (Ag NPs, Ag+), were formed on a custom-built papermaking vacuum table. Wet paper sheets (about 15 × 20 cm) were dried on the glass surface at ambient temperature. From these paper sheets, small circle samples were cut by hole punching, and then used for microbial tests. Ageing was carried out in a climatic chamber (MEMMERT HCP246) at 90 °C and with a relative humidity of 59%, for 12 days. All samples were aged under the same conditions. The pH measurements of the paper samples were carried out according to the TAPPI T 529 om-88 norm using a flat plate electrode (Flatrode Hamilton, 809 Titrando from Metrohm). Samples were cut out from the prepared paper sheets, and a drop of water was placed on their surfaces. The electrode was then applied to each sample, and the pH was measured until a stable value was reached. The zero-span breaking strength was measured according to the TAPPI T236 norm (TAPPI 1996). Before measurements, samples were conditioned according to the D685 ASTM standard, at 23 °C and 50% RH. Surface topology was analysed by optical microscopy (Leica DM2000) equipped with a digital camera. Imaging was carried out using reflected and transmitted light modes, respectively. To obtain representative images, imaging was carried out at five different places of the material (test of material homogeneity). The surface topography of the prepared materials was examined by using scanning electron microscopy (SEM) equipped with a probe for chemical analysis of specimens in microareas with energy dispersive X-ray spectroscopy. A scanning electron microscope (Nova Nano SEM 300 FEI Company) was used for high-quality magnification of the paper morphology. Measurements were carried out using the ColourQuestXE (HunterLab) colorimeter. Measurement conditions were as follows: measuring surface ∅ = 9.5 mm, observer 2°, illuminant D65, specular reflection excluded. A micro fading tester was used to assess the lightfastness of the prepared paper samples. The micro fading tester, a relatively novel device which can be used to obtain quick and non-destructive measurements of material colour change caused by incident light, was described in (Lerwill et al. 2008; Łojewski et al. 2011). The instrument was equipped with a high power xenon light source and VIS spectrometer, which allow induced colour changes to be monitored. Three lightfastness measurements were taken for each type of paper. The weight-averaged degree of polymerisation (DPw) of cellulose (cellulose triphenylcarbamate, CTC) was determined by size exclusion chromatography (SEC). The details concerning the analytical procedures used can be found elsewhere (Pawcenis et al. 2015). In brief, analysis of molecular mass distributions was carried out in tetrahydrofurane (THF) solvent used as a mobile phase, with double detection: (1) by multiple angle laser light scattering (MALLS, Waters), and (2) refractive index (RI). Both detectors worked at a light wavelength of 658 nm. In the measurements, a value of the specific increment of the refractive index equal to 0.162 cm3/g was used. The paper samples containing Ag0, Ag+ and zeolite were first defibred in a beaker in 50 cm3 of water (the process was aided by ultrasound waves). 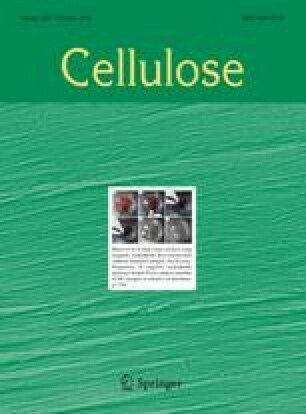 The standard procedure of preparing cellulose material was applied (Lauriol et al. 1987; Stol et al. 2002), using cellulose derivative CTC in THF solution. The AgFAU was removed from the CTC solutions by filtration through a Teflon syringe filter with pore diameter of 0.45 μm. The other additives were removed before derivatisation by washing. Escherichia coli from the culture collection of the laboratory of the Plant-Microbial Interaction Group of the Jagiellonian University (Kraków, PL) were used in the laboratory tests. A detailed description of the sample preparation and analytical procedure can be found in our previous work (Łojewska et al. 2015). The efficiency of the biocidal process on the prepared paper samples was checked using the test LuciPac Pen equipped with a lumitester (Kikkoman lumitester PD-20) (ATP + AMP, Hygiene Monitoring test kit from Kikkoman Corp., code 60331), in accordance with the manufacturer’s instructions. The test gives relative content of ATP, ADP and AMP (RLU—relative luminescence units). The progress of ion exchange was monitored by XRF analysis, the results of which are shown in Fig. 1. It can be noted that the time necessary to achieve saturation in ion exchange was around 2 h. For the assumed half exchange, a time of 1 h was chosen. The degree of ion exchange was then measured by the XRF method, by digesting the samples in concentrated HNO3. In order to dispose of the external unattached silver moieties, complexation using EDTA sodium salt was employed. The progress of elution with the EDTA solution of a given concentration was monitored by XRF analysis of eluate solutions. To check the efficiency of EDTA washing, the AgFAU samples were also treated with the same quantities of water. After repeated treatment with the same portions of EDTA, the amount of silver in the eluent solution stabilises and reaches a low constant value, which is 0.15% of the initial value. This was assigned as the completion of the removal process. The state and amount of silver on the zeolite surface at different stages of elution were also analysed with XPS, which indicated the presence of silver NPs on the initial sample. Semi-quantitative results are shown in Table 2. XPS signal after spectra normalisation, a.u. Corresponding with analysis of eluents, the amount of silver at the surface stabilises after treatment with the EDTA solution of higher concentration (> 0.01 M), and is around four times lower than for the initial sample. Neither the 0.01 M EDTA nor the water were able to remove external silver oxide particles from the zeolite samples. The remaining silver will be called stable silver attached to Al–O- groups in zeolite, impossible to remove by treatment with a chelating agent. The content of silver present in the paper samples is shown in Table 1. For the final PZAg+_EDTA, the amount of silver was measured as 1.5 wt%. It can be noted that, due to the washing procedure, the silver content in the PZAg+_EDTA sample was 27% lower (1.5 wt% drops to 1.1 wt%) than in the PZAg+ untreated sample. In the PAg+ and the PAg0 control samples, Ag content was from two to three times lower compared to the paper modified with the zeolite. The silver content in the paper was not controlled other than by the affinity of different additives (silver cations, silver NPs or AgFAU particles) to cellulose fibres, which varies from sample to sample. As can be inferred from the optical images of the final paper sample PZAg+_EDTA, the zeolite filler dispersed evenly within the paper pulp (Fig. 2a, b). The zeolite particles can be noted as black spots in the transmission image of the sample (Fig. 2a). What is more, SEM analysis confirmed that zeolite is presented on the cellulose fibres. The back-scattered electron mode allowed silver-exchanged zeolite to be shown as brighter spots (Fig. 3). In the picture, there are also marked (as numbers) places where EDX analysis was performed. The average values of element content (Table 3) confirm the presence of elements typical for zeolite (Al, Si, O), as well as for silver which was introduced to zeolite. The pH values (Fig. 4) of the paper samples containing silver in any form were lower than for the reference samples without silver; for P and PZ0, pH amounted to 8.8 ± 0.25, 9.4 ± 0.08, respectively. The lowest value was observed for sample PAg+(4.7 ± 0.11). For samples which contained zeolites, both unmodified and modified, the pH values were higher, 5.9 ± 0.03; 7.00 ± 0.04, respectively. Although, the addition of zeolite with trapped silver causes a decrease in the pH value, the decrease is much lower than for materials in which the active agent was presented in unbound form. It seems that the higher acidity of paper material designed for packaging is not an obstacle. In fact, in the long run the acidity of paper is responsible for the loss of the mechanical strength of paper or cellulose-based materials caused by hydrolysis of cellulose fibres (Chu 1981; Łojewski et al. 2010). Low pH of cellulose-based materials may result from, amongst other things, the manufacturing process, the presence of acids in the raw materials, or as products of cellulose degradation. In the presence of water molecules (atmospheric moisture, bound water) an acid hydrolysis reaction occurs. Therefore, hydrolytic cleavage of β(1-4) glycosidic bonds leads to shortening of cellulose chains. This process will be reflected in the consecutive decrease of average DP value, and possibly in loss of mechanical strength of cellulose fibres. According to the results of zero-span breaking strength of the paper samples, of all tested materials the PZAg+_EDTA was around 20% stronger than unmodified paper, and stronger than the rest of the samples (Fig. 5). The presence of silver or silver oxide crystallites in paper (PAg+, PAg0, PZAg+) weakens the strength of cellulose fibres in comparison with the pure paper sample P. This can be explained by the modification of the hydrogen bonding network with silver cations, which interact directly with –OH groups in cellulose chains or are electrostatically attracted by them as high electronic density is located just on the surface of the fibres due to the enrichment with –OH groups (He et al. 2003). Indeed, it has been documented that hydrogen bonding is responsible not only for the crystallinity of cellulose, but also for tensile strength (Chu 1981). Let us note that, even in the sample containing zero valent silver NPs (PZAg0), the presence of Ag+ cannot be excluded as the sonication process used for silver reduction proceeded with high but limited efficiency. In the paper sample PZAg+, which was not eluted, the crystallites of silver oxide are still present. However, it has to be taken into account that the conclusions drawn from the results of the measurements of mechanical properties are not very firm, due to high experimental error. The results of paper mechanical resistance are consistent with paper acidity (compare Figs. 4, 5). This means that paper acidity can be correlated with cellulose fibre strength and used as a gauge for predicting mechanical properties. In brief, paper sample PAg0, containing silver NPs, demonstrated both much lower pH and breaking strength than the final material prepared by us containing silver-exchanged zeolite PZAg+_EDTA. It can also be noted from the comparison of the PZAg+and PZAg+_EDTA samples that washing with EDTA improves both the acidity and mechanical properties of the modified paper material. The degree of polymerisation (DPw) of the initial unaged and aged samples was assessed based on the SEC measurements of molecular mass distribution of cellulose. When comparing the unaged samples, all the initial values were similar and fell in the range 1200-1400 DPw, except the unaged sample containing zeolite PZAg+, for which DPw was about 1070. An important observation is also that the DPw of the final sample (PZAg+_EDTA) is the highest among the studied samples – even up to around 100 units higher than for the reference paper sample (see Fig. 6). The same observation can be made for the initial PAg0 paper containing silver NPs. Upon thermal ageing, the decrease in DPw values can be noted for all samples. The lowest degradation was measured for P samples, and there is almost no degradation at all for the pure zeolite-enriched paper sample PZ0. The highest drop in DPw values was shown by the PAg+ and PAg0 samples with silver additives, indicating highly degraded cellulose chains of the 200 DPw value. There is a noteworthy difference between the PAg0 sample with silver NPs and the final sample of PZAg+_EDTA, which confirms the conclusion about the positive influence of faujasite exchanged with silver on the condition of both cellulose chains and fibres in the paper material. The parameter L* from the CIELab colour model was used as the measure of brightness—L* with a range from 0 (black) to 100 (white). The total colour change (∆E) was calculated from the L*, a*, b* values following the equation described in (Gulrajani 2010). For the initial samples, regardless of the filler composition, no colour differences were noted among any sample containing silver, by either colour change indicator (L* and ∆E) in comparison with the reference paper sample P. The results presenting the differences that occurred after 2 months of storage at 23 °C and 50% RH are shown in Fig. 7. There, for all samples containing silver, an average drop of around 20% in the L* values was observed in comparison with the reference paper sample P. An important observation is that there was almost no difference between paper samples with silver NPs (PAg0) and our final material (PZAg+_EDTA). Colour stability (lightfastness) over time was also measured by spot light ageing tests performed with a micro fading tester. The results are expressed by ∆E values in Fig. 8. Again, the highest colour change values were noted for the samples containing silver, reaching 35 units for the PAg+ sample. The lightfastness of paper Ag NPs and the final sample PZAg+_EDTA is very much alike, with only three ∆E units difference. The antimicrobial properties of the obtained final material and the reference samples are presented in Fig. 9. The tests were performed with respect to E. coli strains used typically as a representative to assess the biocidal properties of materials. The highest and comparable activity can be noted for both paper samples containing zeolites, as can be judged from the comparison of the ATP/ADP/AMP content in the samples (expressed as counts) in Fig. 9. The content of adenosine phosphates can be used as a direct measure of the bioactivity of the living organisms, especially if the bacterial strain is of the same identity (as discussed by Kwiatkowska et al. (2016) and references therein). The greatest drop in the values was observed for both the samples containing zeolites, PZAg+ and the final PZAg+_EDTA, and slightly less so for the PAg+ sample. This indicates that in fact the active silver species in the mechanism of biocidal activity are silver cations and not silver zero valent NPs (PAg0), which respond comparably to the paper reference sample P, indicating no biocidal activity and a low concentration of Ag+. 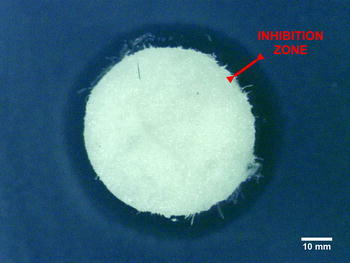 To illustrate the action of materials against E.coli strain, the inhibition zone is presented (Fig. 10). A halo, proving the antimicrobial behaviour of manufactured material, can be seen around the paper disc. A new paper material with antimicrobial activity was obtained as an alternative to materials containing silver NPs. The properties of the modified paper and reference samples were assessed by measurements of pH, tensile strength, DPw and colour change. The antimicrobial properties were established for the E. coli strain, used as a standard testing microorganism. The new paper material contains the faujasite mineral exchanged with silver cations, which is unique in that that it contains exclusively the cations bound to faujasite mostly in its voids. This was achieved by the elution procedure elaborated for the material, which utilised a strong chelating agent (Na2EDTA) that is unable to penetrate the faujasite voids due to the size of the molecule. The other materials of this kind described in the literature (LEE et al. 2006; Taniguchi et al. 2006) also contain silver oxide NPs, which are formed during ion exchange in zeolites. The new material shows greatly improved cellulose fibre quality in comparison with pure paper, and especially with paper containing silver NPs, as can be inferred from the tensile strength measurements and DP measurements of cellulose in paper. This observation corresponds to the pH of the material, which is higher than that measured for paper with silver NPs. The visual properties of the new material with the silver-exchanged faujasite are also better, as can be judged from the results of natural and accelerated light ageing tests. Most importantly, the new material shows outstanding biocidal activity regarding Escherichia coli, typically used as a control strain of bacteria for antimicrobial tests. It must be emphasised that the reference paper sample with silver NPs showed no activity for this strain. The new paper material shows potential for use as a packaging material in applications that demand sorptive and antimicrobial properties. The information included in this paper is protected by Polish and EU patent applications (Łojewska et al. 2015). The research was performed within grant SPB 811/N-COST/2010/0 from National Science Centre, Poland. The National Science Centre, Poland - project No. 2016/23/B/ST8/02024 is also acknowledged for additional analyses.